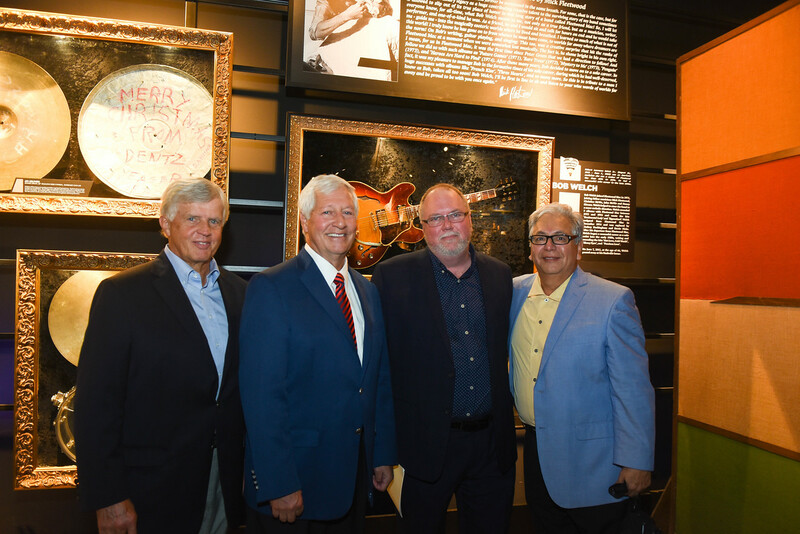 during Welch Exhibit Opening and Scholarship Announcement Musicians Hall of Fame at Belmont University in Nashville, Tennessee, August 27, 2018. Days before acclaimed solo musician and former Fleetwood Mac member Bob Welch would have turned 73, the Musicians Hall of Fame unveiled today a new exhibit honoring the late artist’s career and impact, a legacy that will live on thanks to a newly created endowed scholarship in his and wife Wendy’s name at Belmont University. Following Bob’s death in 2012 and Wendy’s passing in 2016, Mrs. Welch bequeathed her husband’s memorabilia and music business interests, including royalty streams, to Belmont for the purpose of endowing a scholarship to benefit students in the University’s renowned School of Music. Belmont students Nathan Travis and Matt Davidson perform during Welch Exhibit Opening and Scholarship Announcement Musicians Hall of Fame at Belmont University in Nashville, Tennessee, August 27, 2018. Welch released five solo albums, including his breakout 1977 album, “French Kiss,” following his departure from Fleetwood Mac, with whom he recorded five albums from 1971-1974. His solo career produced 20 singles, including the hits “Hot Love, Cold World,” “Ebony Eyes,” “Precious Love” and the seminal song, “Sentimental Lady,” which first appeared on the 1972 Fleetwood Mac album “Bare Trees” and included an extra verse. “Sentimental Lady” was performed live at today’s event by two Belmont students: Nathan Travis, who is a sophomore commercial music major with a music business emphasis and is from Hilliard, Ohio, and Matt Davidson, who is a junior commercial music major with a music business emphasis and is from Shreveport, Louisiana. Fleetwood’s tribute, along with one of Welch’s guitars and other memorabilia, are currently on display at the Musician’s Hall of Fame & Museum, located at 401 Gay Street in downtown Nashville.